Chinese company Oppo launched Oppo K1, the first smartphone of its series in the domestic market. The key feature of this new handset of Oppo is the in-display fingerprint sensor. Other features include a 6.4-inch display, Snapdragon 660 processor, two rear camera and 25-megapixel selfie camera. Keep in mind that this phone comes with 4 GB and 6 GB RAM. The Oppo K1 is a mid-range handset, i.e. its proximity to the rest of the price segment of less than Rs 20,000. At the moment, no information has been given about the availability of 1 OPOPO in India. 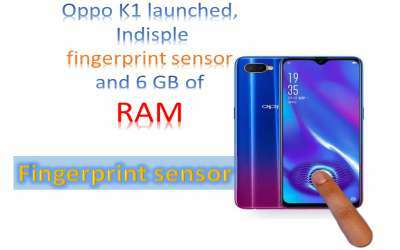 Oppo K1 launched, In-display fingerprint sensor and 6 GB of RAM -The price of Oppo K1 in the Chinese market is 1,599 Chinese yuan (about 17,100 rupees). This price is of 4 GB RAM / 64 GB inbuilt storage. The 6 GB RAM and 64 GB storage variants of this phone will be sold in 1,799 Chinese Yuan (around Rs.19,300). The smartphone is made available in Moka Red and Blue colors. Pre-order booking of Oppo K1 has started in China. Oppo K1 launched, In-display fingerprint sensor and 6 GB of RAM -Oppo's 1 Out of Box will run on ColorOs 5.2 based on Android 8.1 Oreo. The smartphone will have a 6.4-inch full-HD + (1080x2340 pixels) display, with 19.5: 9 aspect ratios. It has been claimed to have about 91 percent screen-to-body ratio. The handset uses the Octa-Core Qualcomm Snapdragon 660 processor, which is the speed of 2.2 GHz. Oppo 1 will have the option of 4 GB RAM and 6 GB RAM. Oppo K1 has dual camera setup on the previous part. The primary camera sensor is 16 megapixels and a secondary camera sensor is 2 megapixels. The front panel has a 25-megapixel selfie camera.